One of my major races of the year came to be. Actually this was a bucket list race for me to do! 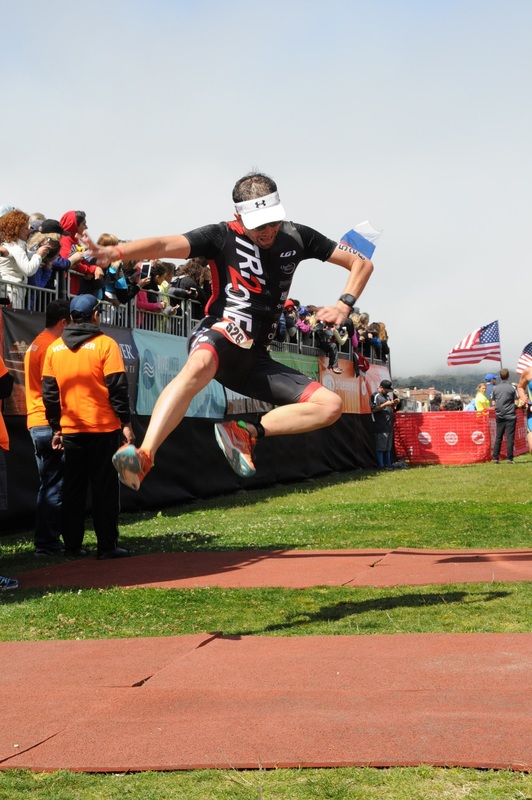 Escape from Alcatraz Triathlon in its 35th anniversary, is almost as old as the sport is (the sport of triathlon is 40 years old!). It was my first time in the city of San Francisco, and for sure it was a city that I wanted to visit for a while. So different from sunny Miami… hills everywhere! My friends and I made it to the Bay area on Friday and took advantage to enjoy the city as most as we could. The food is so good, and we certainly need to thank our buddy Matty for such good suggestions. For us it was certainly pretty cold, but I got to admit that the weather was quite refreshing from the eternal summer in Miami. On Saturday we pickup our bikes and rode around the Golden Gate Park area and the Presidio… made a pilgrimage to Yoda's statue and had just a little taste of the hills that were waiting for us on race day. Afterwards, we had a small run enjoying the bay and after we made the eternal line to check in for the race. If you are doing the race I suggest you to check in as early as possible, because the line is one of the most long lines I had done for a check-in on any race that I have done. Yes, it was almost 2 hour wait in line. The rest of the day was to relax and enjoy more cool places from the city. Sunday we had a really early wake up call (like 3am). Not only you have to prepare transition, but you have to take a shuttle to Pier 3 in order to take the ferry to Alcatraz Island. Once on the ferry, we had to wait 1:30 until the start of the race at 7:30am. 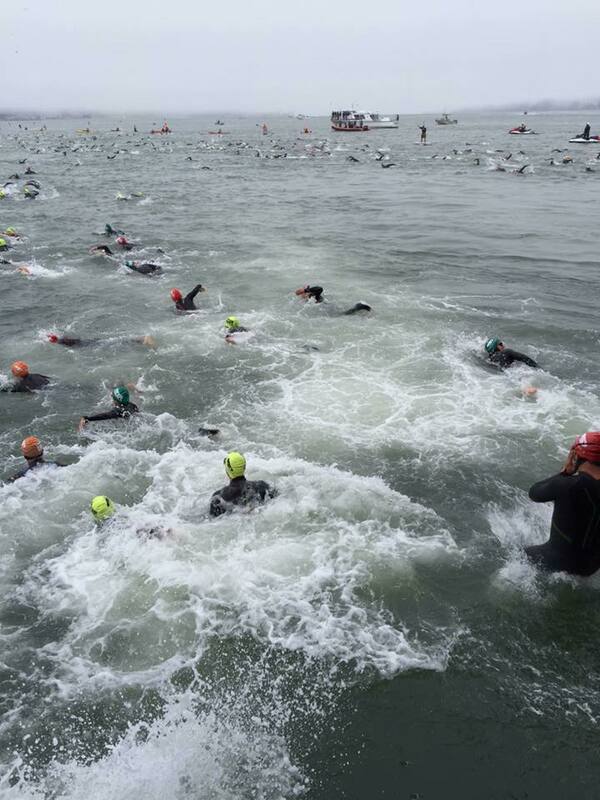 The ferry was packed with 2000 athletes, which all will unload on the cold waters of San Francisco Bay within 5 minutes. 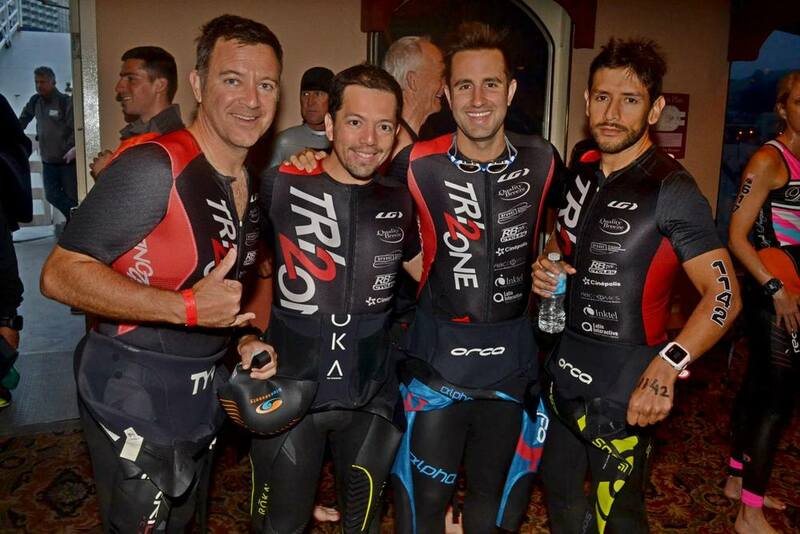 Together with my friends, Bernie, Matty and Anduchi embarked on a remarkable day to take on one of the most especial and epic races in triathlon. You start of the from the ferry and jump into the cold waters of the bay. The first 5 minutes are horrible, as your body gets adjusted to the cold and your face is completely frozen. I was lucky that Bernie suggested me to buy some insulated booties for the swim, which was my first time using them, as well as a insulated cap for my head. Once your body gets used to the cold, the rest of the swim is fine. I can finally tell that I felt really comfortable in the wetsuit… which probably has been the first time I have ever said that, having a track record of always overheating inside it. Managing the current all the way to shore, you have to be careful since the current can easily push you away off course and maybe you will land where all the sharks are… and of course we don’t want that ;) . The panorama was amazing… 2000 people kickin, punching and swimming on top of you, Alcatraz Island behind you and the foggy San Francisco skyline in front of you… breathtaking. Once on shore… transition was something completely unique (as most of this race). First you have to go to a mini transition located at the exit of the swim, where you have a special needs bag with items that will help you run to the actual T1, which is located almost a mile from the swim out. 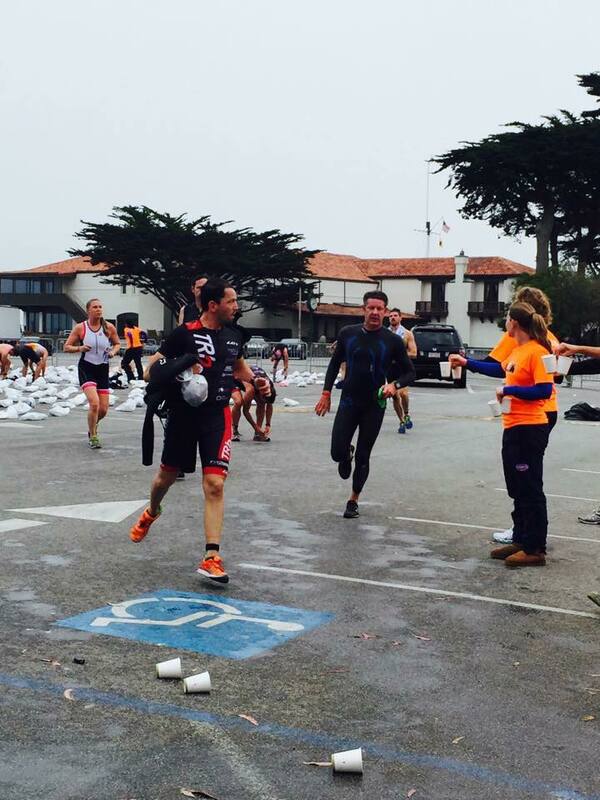 Here I took out my wetsuit, dry a little, put socks and running shoes, and carried my bag together with my wetsuit all the way to T1. 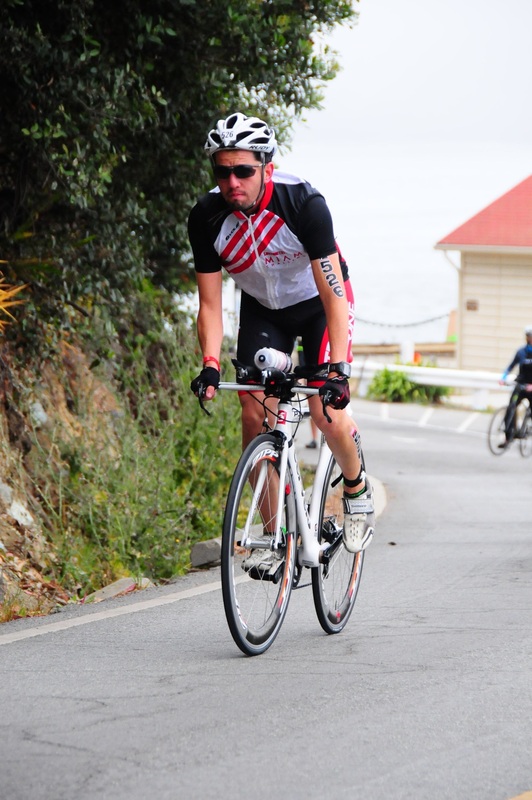 Once on T1 I took my bike and started the hilly ride on San Francisco. I saw Matty on the bike and once the hills began, he completely took off. For me, the ride was something more of conserving energy rather than to go all out. I’m not good at riding hills, and certainly this decision was the best I could have taken. A lot of parts were brutal, but specially coming back…. I could have easily stopped in the middle off the hill and started walking… but then again.. what’s the point of doing a race?, so I just had to tighten my teeth together and embrace the pain. Once the bike was over, I came to transition and felt really good. The plan to save as much energy as I could on the bike seems to have work. I took out my wind breaker, but keep my gloves, which became quickly uncomfortable to run with… but I was lucky enough to see Kim, Bernie’s wife, and I gave her my gloves. Around mile and a half, Bernie catches up to me and we start running together. Here is the start of the best part of the race. While Bernie was encouraging me not to die, a little further up we see Matty and we start catching up to him, or at least not to lose him from our sights. Moments later Anduchi starts catching up to us, so then all of the sudden the 4 of us that came from Miami to San Francisco were running together and having the most fun, while climbing hills, running over the beach, going up the infamous Sand Ladder and the people looking at us weird because we were so LOUD hahaha. From the 8 mile run we ended up doing around 4-5 miles together. Certainly for me that was the best part of the race. This was for sure once of the most unique races I have ever done. Is a HARD race, and it has an atypical distance of a 1.5 swim, 18 mile bike and 8 mile run, which it falls between an Olympic and a Half Iron distance race. I am really glad that I put this race in my bucket list, and as Macca always says… “This is the best race in the USA,” which I can attest that is certainly true. Regardless of all of that, I can say too is that what it did this race so special certainly was the company of my friends.